I’ve been able to capture some pretty epic moments while also living them myself. …and FOOD. One might say I have an addiction. I haven’t met a food I didn’t like (except my archnemesis, celery) and love to try new restaurants. A few years ago, I moved out of my parent’s house (I had just graduated from college), and before I left I wanted to write down all of my mom’s fantastic recipes. Once I had finished logging all of her famous recipes (I put them in a photo album, works great for cataloging recipe note cards), I didn’t stop. I looked through all of the twenty-plus cookbooks she had and wrote down good-looking recipes from them. I finally move out on my own, but my recipe transcribing didn’t stop. When I would visit my grandmother or aunt, I copied down recipes for dishes they were known for, and then raided THEIR recipe books. I was obsessed, addicted. I think I probably have ADD. I can’t sit still for very long, and am always doing something with my hands (which is probably why I work in the industry that I do)…I can’t sit and watch TV or a movie and just watch, I have to be doing something as well. Copying down recipes on those little notebook paper notecards became an easy way for me to stay busy and focused and relaxed when I got done with a busy day, which is pretty much everyday in my life. Working in the television news industry is rough. I almost got killed by two tornadoes last spring, I’ve seen more dead bodies than most cops have, and I’m constantly working different schedules & times of the day (AND night). Writing down these recipes from cookbooks, magazines (I subscribe to Food Network magazine! ), those little recipe card booklets from Pillsbury and Betty Crocker you find near the checkout aisle at the grocery store…writing down those recipes became my hobby. I started with one medium-sized photo album. I now have that photo album, plus a regular sized recipe box, plus a cute antique Bisquick recipe box, PLUS two more recipe boxes full of recipes that I all handwrote on notecards. So what do you do with a collection of probably thousands of recipes? You cook them, duh! And I love to cook. But up until I started this blog, I had rarely ever cooked a recipe out of this collection. 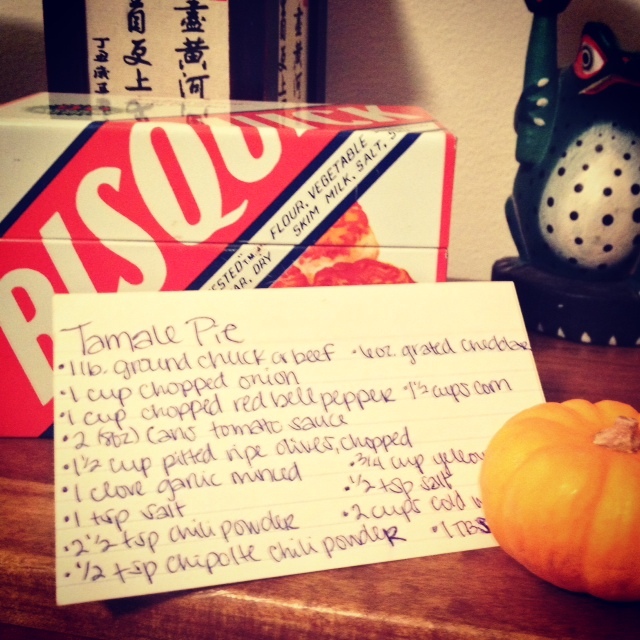 So I had an idea…what if I randomly draw a recipe out of my recipe boxes and then cooked it? I’d randomly draw 2-3 recipes a week, buy the ingredients, cook them, then test them out, and then write about them. Brilliant! I’ve got recipes for meats, meals, snacks, sides, casseroles, desserts, drinks….dishes to take to potlucks, parties, & cookouts…easy-to-make, fancy, haute cuisine….what recipe will I draw next? Stay tuned to find out! What a fantastic idea! I can’t wait to see what you will cook next! Hi, thank you so much for visiting my blog and for the ‘follow’. Looking forward to visiting yours :-). Have a lovely weekend. The year my parents divorced was a hard one of my Mom Financially. She gave home made gifts that year. She worried they would not be enough, but we absolutely loved them. Mom gave me a cookbook she created of all the family recipes I grew up with, Kringla among them. I love the idea of your blog because it strikes home. Wishing you all the best in your journey! What a great story. I don’t think there’s anything better than getting recipes handed down from generation to generation. Some of these recipes we may never see again if we don’t let their legacy live on through us! I nominated you for the creative blogger award. I did not see where you have been nominated, so hope you can participate! I enjoy your blog. You sound like a girl after my own heart! Based on the shelves upon shelves of Food Network Magazines, hand-written cards, and cookbooks that I refuse to part with, it sounds like we have a lot in common – I’m looking forward to reading more of your posts! Thanks for checking out my blog! Hey there, Colleen! Since June is the 6th month of the year, I’m following 6 fun and interesting blogs each day, and you’re one of them! Follow me back if you like at http://www.thatssojacob.wordpress.com and make six new blog friends of your own. Have a great day! I appreciate connecting with you! Thank you for your visit on my blog and your follow! Great inspirations on your blog! Same here. Just wish I had more time to test out all those recipes. Enjoy and have fun. Our Feb 2017 Share and Inspire Others! Recipe Exchange: Bread: Sweet and Savory. Great to meet you Colleen – looking forwards to following your blog! Thanks for stopping by! I’m originally from Texas but have lived in Oklahoma for the last five years. Pretty much the same though! I hope you enjoy reading! Nice to meet you, Leen! I’m John. You have a collection of yumlicious recipes lol!! I thoroughly enjoy them! Thanks for sharing them!